The empirical research on the impact of pricing strategies on sales volumes is scarce because of the challenges associated with obtaining actual sales data from retailers. This dissertation contributes to bridging this gap in academic knowledge by investigating the influence of pricing methods on the sales volume dynamics in three UK-based, online consumer electronics vendors. The data is collected by means of semi-structured interviews with one owner/manager and two general managers of small and medium-sized online retailers. The key finding is that the companies experiencing an increase in their sales volumes over the past year followed the same pricing strategy, which combined competitive pricing, discounting and personalised pricing. For the firm employing the mix of competitive pricing, discounting and bundling, the sales volume increase was marginal, despite the overall positive dynamics of online electronics sales in the UK over the past year. These findings indicate that a pricing strategy can either allow a company to make use of its market opportunities, or prevent it from doing that. Considering the results of this project, British online consumer electronics vendors can be advised to adopt a mix of competitive, discounted and personalised pricing to effectively increase their sales volumes in the online environment. Price and pricing strategies have traditionally been approached as the major influences on consumer purchase intention in online and offline retail (Djatmiko and Pradana, 2016; Lin, 2015; Ma, 2017; Sunil, 2015; Yao and Oppewal, 2016). However, there is a lack of empirical research examining the impact of pricing on actual sales volumes, which can be explained by the difficulty of obtaining the sales data from retailers. 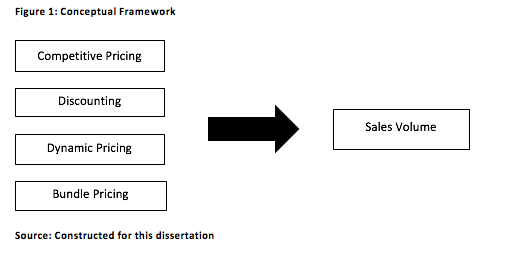 The purpose of this dissertation is to bridge the mentioned research gap by evaluating the impact of various pricing strategies on the sales volume in the context of online consumer electronics retail. The choice of this market was prompted by the pricing challenges this industry is facing due to technological change (Kilroy et al., 2015). The British consumer electronics market was estimated at £16.1 billion in 2016 (Futuresource, 2017). In 2017, the combined retailer revenues followed a declining trend in all segments, with the exception of wireless speakers and wearable electronics, which was explained by the durability of most consumer electronics goods and their high penetration rates in the UK (Euromonitor, 2017). At the same time, online trade has increased across all product segments (Euromonitor, 2017). This opportunity available to online retailers could be further advanced by more sophisticated pricing strategies. The aim of this dissertation is to evaluate the impact of pricing strategies on the sales volumes of online vendors in the UK consumer electronics segment. The following objectives lead to the achievement of the primary aim. To examine the theoretical rationale behind the key pricing strategies. To identify the most frequently employed pricing strategies in the online consumer electronics retail. To compare the effectiveness of various pricing strategies in terms of increasing vendors’ sales volume. To develop recommendations for marketing practitioners concerning how to maximise sales through strategy in the online consumer electronics retail. This research project intends to collect up-to-date empirical evidence on the effectiveness of diverse pricing strategies in the UK online consumer electronics retail market. The collected information would contribute to a better understanding of consumer behaviour in the online retail context. The study will also provide guidelines to marketing practitioners on which pricing strategies can work best to increase sales volumes in the online trade of consumer electronics. Semi-structured interviews are conducted in this research to collect primary data. In total, three interviews are carried out with the owners or managers of UK-based, consumer electronics online retail platforms. To identify patterns in the interview data, the method of qualitative analysis is employed. This dissertation is organised into five chapters. In the first chapter, the rationale, context, aim, objectives, potential contribution and methodology of this research project are explained. The second chapter offers a critical discussion of evidence from secondary sources. The research methodology is detailed in the third chapter. The fourth chapter incorporates the analysis and discussion of the primary research findings. Conclusions and recommendations are provided in the fifth chapter. One of the major theories explaining the impact of pricing strategies on consumer behaviour, which ultimately determines the sales volume, is the customer utility theory. The core postulate of this theory is that customers would use their limited financial resources to maximise their satisfaction (Fjermestad and Robertson, 2015). Thus, the best-selling goods would be those delivering the greatest customer value at the lowest cost (Rothenberg and Siems, 2008). Gilbride et al. (2016) found that the expected utility reliably predicted consumer choices on an online electronics vendor’s website. However, the underlying assumption of this theory about consumer decision-making as being fully rational is challenged by the abundant evidence of customers’ frequently making apparently irrational decisions (Morgan et al., 2015). Another influential conceptual framework is the Theory of Planned Behaviour (TPB). According to this concept, consumer decision-making is guided by the subjective norm, attitude and perceived behavioural control (Ajzen, 1991). In application to pricing, the customer would be willing to purchase a particular good when its price is not much different from what they consider as ‘normal’ or ‘reasonable’ for this good (Cheah et al., 2015). Therefore, the TPB explains the phenomenon of prestigious pricing and the intention of customers to be discouraged by the prices they considered too low for a specific product. The limitation of the TPB is that it cannot be used for designing pricing strategies in real consumer markets where it is often not feasible to determine each customer’s subjective norm. The two common approaches to pricing are cost-based and value-based, with the latter being considered as more sophisticated and more compatible with revenue maximisation (Lei et al., 2015). However, the cost-based approach has important advantages of being more feasible to implement and enabling the company to secure its profit margins (Krafft and Mantrala, 2009). Some scholars also single out competitive pricing as an independent pricing approach, which is the determination of prices on the basis of those set by competitors in the market (Boone and Kurtz, 2010). Competitive pricing is relatively easy to implement, but it involves the danger of selling at a loss when the company has higher costs than competitors do. The competitive pricing strategy was used in an extreme way by one of the largest global online electronics retailers, Best Buy. This company offers a price-matching guarantee for identical products that were found by customers to sell at a lower price elsewhere (Best Buy, 2017). Before 2016, a similar price-matching programme had been practiced by Amazon (Perez, 2016); and in 2017, it was adopted by eBay for about 20,000 items, including electronics pricing (Rutt, 2017). The price matching-policy by large online retailers might be imposing a considerable pressure on their smaller rivals to keep their prices low, particularly because the array of products in the consumer electronics segment is limited and the same item is often sold across multiple platforms. One more factor increasing the importance of competitive pricing in the online electronics retail is the availability of price-comparison websites and apps that enable customers to select the most attractive offer (Kilroy et al., 2015). Thus, one may assume that competitive pricing is commonly employed in the online electronics retail segment. Discounting is a widely employed pricing strategy that is intended to maximise sales volumes, although through a reduction in profit margins (Boone and Kurtz, 2010). Discounting is frequently used for goods with negative consumer reviews to alleviate the downward impact of such reviews on sales (Kuo and Nakhata, 2016). A particular case of discounting is the loss leader pricing when the company makes up for losses from the discounted sales of a single item by increased cross-sales of non-discounted items (Jiang et al., 2015). Employing the loss leader strategy, an electronics retailer can increase the sales volume and profits at the same time, but only provided that the product range is broad enough (Kocas et al., 2018). Analysing the data from Amazon, Kocas and Akkan (2016) demonstrated that when the cross-sales probability was high, sales volumes and profits could be maximised by discounting top-selling items, which is rather counterintuitive. The practical implication of Kocas and Akkan’s (2016) conclusion for the electronics segment is limited because these observations were received from the investigation of intangible items, such as digital books, movies and songs. Dynamic pricing, also known as differentiated or personalised pricing, has become increasingly popular with online retailers over the past several years as they became able to accumulate large amounts of data about their customers’ past purchasing and searching behaviour and use it for offer customisation (Adams, 2017). Amazon was observed to re-price its top-selling items up to 12 times per day, while other large online retailers changed prices for 10-20% of their goods daily (Kilroy et al., 2015). Chen and Chen (2017) found that personalised pricing could increase the online sales volumes of multi-channel retailers. However, this effect was established on a simulation model and, hence, might not be applicable to real-world settings. The recent empirical research demonstrates that customers have a relatively high tolerance of price discrimination across the online and offline channels of the same retailer (Fassnacht and Unterhuber, 2016; Kukar-Kinney and Carlson, 2015). The majority of customers tend to have an implicit assumption that running a brick-and-mortar store involves higher costs (Fassnacht and Unterhuber, 2016); so they expect the same item to be cheaper in online stores even when no promotions are available (Kukar-Kinney and Carlson, 2015). This conventional belief is challenged by the empirical evidence collected by Cavallo (2017) in 10 countries, including the UK. The scholar discovered that the prices for electronics in multi-channel retailers were almost identical across the online and offline channels for 83% of goods (Cavallo, 2017). In the UK, the highest average level of price aggregation (91%) was achieved across platforms (Cavallo, 2017). Cavallo’s (2017) findings are highly reliable as they were based on the examination of 38,000 prices for 24,000 items over two years. One can conclude from this data that British online retailers are less likely to adopt this kind of differentiation pricing than their counterparts in other developed nations. Bundle pricing is a strategy of sales volume maximisation, which is similar to discounting (Krafft and Mantrala, 2009). In the online electronics retail, a typical bundle combines physical goods and delivery services. In addition, some retailers such as Best Buy include tech support services into their bundles (Meyer and Shankar, 2016). Bundling can be particularly effective in combination with discounting. Kuo and Nakhata (2016) found a small discount on a bundle to produce the same increase in sales as a much larger discount on an individual product. These findings are highly credible as they were based on the experiment involving 115 actual online customers. Other pricing strategies used in the online consumer electronics market include drip pricing (Robbert, 2015) and psychological pricing (Boone and Kurtz, 2010). However, to remain focused, the scope of this inquiry was limited to the four most common strategies identified above. Discounted pricing was generally approached as a positive influence on customers’ purchase intention (Kukar-Kinney and Carlson, 2015; Sahay et al., 2015; Sunil, 2015), though this relationship can be mediated by perceived value and general attitude towards e-deals (Cheah et al., 2015) and also by search costs (Lin, 2015). Besides, discounting can positively affect e-loyalty, as emphasised in the recent findings by Zheng et al. (2017) on a sample of 537 customers. Trying to find new bargains, customers visited the online retailer’s website more frequently and, eventually, made more purchases (Zheng et al., 2017). The positive impact of discounting on purchase intention is challenged by the new empirical evidence that a considerable proportion of customers might lack the skills to interpret the discounts correctly. Having surveyed 607 customers, Tan and Bogomolova (2016) found that 20% of the sample misinterpreted the discounted offers and 13% failed to calculate their savings. These ratios were even higher in the lower-income groups (Tan and Bogomolova, 2016). Since Tan and Bogomolova’s (2016) findings were based on an Australian sample, they cannot be extrapolated to the UK market. There is evidence that dynamic pricing and price drops in particular, can increase the participation in e-WOM and general engagement with the product (Lee et al., 2016). Lee et al. (2016) found that the number of post-purchase customer reviews on a piece of electronics sold on Amazon could increase significantly after a price drop, while the tone of these reviews became more negative. The second price drop, three months later, failed to produce any observable effect (Lee et al., 2016). A significant limitation of Lee’s et al. (2016) is that the effect on sales volume was not assessed. Empirical researchers’ findings on the impact of bundling on purchase intention and sales are controversial. In Shao’s (2017) analytical model, free shipping was beneficial only for the retailers with small market shares. Song et al. (2017) established that the optimal free-of-charge shipping threshold was higher for the retailers in de-centralised supply chains. In Ma’s (2017) investigation, free shipping increased the purchase intention under long delivery times, but produced a reverse effect under short delivery times. An attempt to resolve the controversy surrounding the effectiveness of bundling was made by Sahay et al. (2015). The scholars found that bundling positively affected the sales of low-priced goods, but not those of high-priced goods (Sahay et al., 2015). In addition, a discount on shipping produced a greater increase in the sales of the whole bundle than a similar discount on any of the included products (Sahay et al., 2015). Since these findings were based on an Indian customer sample, they cannot be generalised to the UK. Overall, one can conclude that the positive effect of bundling is highly conditional and depends on a variety of marketing and cultural factors. The relationship between the identified pricing strategies in the online consumer electronics segment and sales volume is graphically presented below. As shown above, all four strategies have a potential to increase the sales volume in the UK online electronics retail. Discounting and bundling promote customer purchasing behaviour by increasing the perceived value (Cheah et al., 2015). In addition, discounted pricing can increase the sales of non-discounted items, which is known as the cross-sales effect (Jiang et al., 2015; Kocas et al., 2018). Competitive pricing prevents the loss of customers to the competitors selling identical or similar goods at lower prices, which is particularly important considering the easy availability of price comparisons in online retail (Kilroy et al., 2015). Dynamic pricing can generate sales by tailoring the offer to each customer’s individual needs and tastes (Chen and Chen, 2017), but it might also have an adverse effect when perceived by customers as discriminatory (Fassnacht and Unterhuber, 2016). The extent to which these opportunities are exploited by British online retailers is evaluated in the course of primary research. This research is guided by the epistemology of interpretivism. This choice was determined by the nature of the analysed issue. On the one hand, the impact of a pricing strategy on sales volumes is an observable phenomenon that can be assessed in quantitative terms. On the other hand, the exact sales figures are not easily disclosed by companies to outsiders. A failure to obtain this numerical data would have been the major obstacle to positivist research (Bryman and Bell, 2010). Meanwhile, an interpretivist researcher can bypass the lack of exactness by taking a more flexible philosophical stance. When the relationship between pricing and sales is re-conceptualised as socially constructed, subjective perceptions and estimations become an appropriate source of knowledge (Saunders et al., 2009). Adopting interpretivism, the researcher is able to investigate the research phenomenon through an insider perspective (Richie et al., 2013). An important limitation of interpretivism is that it does not enable for achieving a single objective truth (Easterby-Smith et al., 2012). The researcher would only be able to present multiple viewpoints on the focal issue. However, a rigorous conclusion can be still formulated by comparing these multiple perspectives. The research approach of deduction is adopted by this study. The main advantage of deduction is that it allows the researcher to place the findings in the context of the available academic knowledge (Collis and Hussey, 2014). The relationship between pricing strategies and sales is overall well-researched across a variety of industries. By adopting deduction, the researcher would be able to test the established relationships in the novel setting of online electronics retail. In addition, deductive investigations are less time-consuming (Chawla and Sodhi, 2011). The key limitation of deduction is that it cannot lead the researcher to formulating a new theory (Saunders et al., 2009). In this project, this aspect is not critical, since the researcher intends to test the existing theory in a new setting. The interview strategy of data collection was selected for several reasons. Firstly, the data on online sales volumes is not easily available from the websites of online vendors. Since most of these companies are not publicly traded, they are not required to disclose this information. In order to obtain it, the researcher needed to survey or interview the company insiders. The interview method was preferred over surveys because the former offers broader possibilities for establishing rapport (King and Horrocks, 2010). In both interviews and surveys, the reliability of findings strongly depends on the participants’ sincerity and willingness to share information (Collis and Hussey, 2014). With a self-administered survey, researchers have virtually no means to influence the respondents’ mood. Moreover, there is no control over the survey completion process (e.g. the questionnaire can be completed by a different person than originally intended) (Saunders et al., 2009). By contrast, the interview method enables the researcher to use one’s interpersonal skills to engage the interviewees and establish trust. However, the possibility of interviewee bias cannot be completely eliminated, which is a serious limitation of interviews (Patton, 2014). The researcher addressed this problem by accounting for this potential impact in the interpretation of the findings. The next factor determining the choice of interviews was the small population size. To build a statistically significant survey sample, the researcher would have needed to get at least 30 company insiders to participate (Bryman and Bell, 2010). Considering the low accessibility of the target population and the typically low response rate in surveys (Saunders et al., 2009), this target was barely achievable. For interviews, a sample of several individuals or organisations is considered sufficient (Easterby-Smith et al., 2012). It is valid to argue that a small sample size in interviews is more desirable as it allows for investigating the consequences of each case in greater depth (Richie et al., 2013). The interview questions were designed to reveal the evidence of the various pricing strategies and their impact on the sales volume in the sample companies (see Appendix A). A summary of the variables integrated in the interview questions is presented below. As shown above, the implementation of each pricing strategy was assessed by one question. The final question focused on the sales volume dynamics and its relationship with the pricing strategies. The remaining two questions were included to obtain information about the organisational context. All interviews were conducted in English via Skype and recorded for subsequent transcription. Each interview lasted between 15 to 30 minutes. Considering the small amount of the data, transcription was done manually by the researcher. The full transcripts are included in Appendix B. The method of qualitative analysis was employed to make sense of the interview data. The main advantage of this method is that it can be used to extract meaningful patterns from any sets of qualitative data (Kumar, 2014). The resulting conclusions are generally more reliable than in content analysis (Saldana, 2008; Silverman, 2015). The drawback of this analysis type is that the reliability of findings is strongly dependent on the researcher’s ability to correctly interpret the pieces of data and avoid bias (Novikov and Novikov, 2013; Schreier, 2012). To improve the accuracy of interpretation, the interview findings are compared with those reported by other scholars in the literature review chapter. These codes were applied to the interview transcripts. The whole analysis process was done manually. The need for using special software was eliminated by the small amount of data. The researcher obtained informed consent from the interviewees by providing full information about the purpose and scope of this study. To protect the interviewees’ confidentiality, all personal details and real names were omitted from the transcripts. The interviewees and their companies were pseudonymous across all the dissertation materials to prevent their personal identification by readers. The interviewees were not asked to disclose any data that might be a commercial secret (e.g. the exact sales volumes). Thus, the fact of participation in this study is unlikely to cause any adverse consequences to the interviewees’ business. The collected information was stored on the researcher’s personal computer with a backup to the hard drive. The data was not shared with any third party or published in online or offline sources. A password protection was used to prevent any unauthorised access to the collected data. The details of the three interviewees and their businesses are presented in the table below. As shown above, the interviews were conducted with one owner of a small online retail business and two general managers of medium-sized enterprises. All companies have operated in the online consumer electronics segment for quite a long time (from 5 to 12 years). Two firms were purely online vendors, and one was a brick-and-mortar retailer also selling online. Thus, the interview sample represented various categories of electronics retailers. “We can’t really compete with Maplin or Currys on price. They will always have it lower”. “We monitor competitors’ prices closely, but we can’t always match them. As a small company, we have higher costs per unit”. The third managerial interviewee noted that it was not necessary to have a lower price in this market in order to gain a competitive edge. Since all major players had their prices at roughly the same level, it was sufficient not to deviate from it by too much. A similar strategy was followed by the business owner who used Currys as a benchmark and kept the prices in his store no more than 15% higher. The discounting strategy was employed on a regular basis across the three sample companies. The largest discounts (20-50%) were applied to older models of electronics and those not selling up to expectations. One vendor offered 10% of its product array at various discounts at any given point of time. The manager of this firm reported an overwhelming 80% of their total sales coming from discounted offers. In another company, discounts were introduced on a weekly basis by product groups. The manager commented that the greatest increase in sales volume was generated by the highest discounts of 20-30%, but these sales involved a financial loss. “When we display links to other goods on the discount page, those also sell better. They don’t even need to be related. This year we’ve tried just showing random stuff, and it worked”. “Cross-sales, yes. They’re particularly strong when we discount a popular item. Even by 5%. So, we’re doing this more often now”. Nonetheless, the third interviewee reported only a marginal effect on the sales of non-discounted goods. This discrepancy can be explained by the relatively smaller product range in this interviewee’s online store, which is consistent with Kocas’s et al. (2018) findings. “We don’t think it’s a good practice. No one would be happy to know that someone has paid less for the same thing just because they logged from a cheaper smartphone”. “Loyalty points are given for each purchase. The more points a customer collects, the greater personal discount they have. Personal discounts apply only to the items selling at regular price, not to those already discounted”. The manager of the multi-channel vendor also denied having different prices in the online and offline stores and stated that they were maintained at a uniform level. This outcome aligns with the British retailers’ preference for uniform prices across channels that was reported by Cavallo (2017). “The sales of some products increased by 20-25% after they became part of a bundle”. “[B]undles do not always sell better than individual products. Recently we’ve actually had to unbundle some packages to improve sales”. The second managerial interviewee added that this pattern emerged over the past year and attributed it to the change in customer preferences. Nevertheless, the contrasting evidence from the two vendors indicates that the ineffectiveness of bundling in one of them is more likely to be caused by the company-specific issues, such as poor planning of bundle composition. Besides, the second organisation discounted its bundles by a slightly smaller amount than the first one (3-7% against 5-10%). Although apparently small, this difference could be critical to the customer perceptions of the bundle value. Considering the sales dynamics over the past year, two interviewees commented that their sales volumes had increased. The business owner described it as “a good growth”, while the manager merely stated that more goods were sold as compared with the previous year. These findings agree with Euromonitor’s (2017) reporting the sales growth in British online electronics vendors during 2016. The last manager hesitated in defining the dynamics as either flat or “a very minor growth” (General Manager 2). This interviewee attributed the lack of positive sales dynamics to the external causes, such as the post-Brexit economy stagnation and changing consumer spending patterns. However, these adverse factors did not prevent the other two companies in the sample from increasing their sales, so the difference could have resulted from the variance in pricing strategies. The adoption of competitive pricing in the sample organisations co-existed with better sales dynamics, which provides support for Kilroy’s et al. (2015) conclusion. Discounting was employed by all the sampled vendors, with one company making 80% of its sales on discounted items, which is in line with Kuo and Nakhata’s (2016) conclusion about the high potential of this pricing strategy. The evidence of personalised pricing was found in the two more successful companies, supporting Chen and Chen’s (2017) hypothesis. The bundling strategy had no apparent relationship with the sales dynamics, which challenges Kuo and Nakhata’s (2016) findings, but agrees with the assumptions made by Sahay et al. (2015). Overall, competitive and personalised pricing were identified as the strategies most likely to improve sales volumes. In the company with the worst sales dynamics, 80% of the sales were reported to come from discounted items. This effect could be shaped by either the reduced effectiveness of discounting as a stand-alone method because of its broad adoption by rivals (Kilroy et al., 2015), or by the vendor’s failure to generate cross-sales (Jiang et al., 2015). Competitive pricing was used as a supporting strategy, personalised pricing was not employed, and bundling did not deliver the expected results. By contrast, the other two companies set their prices in accordance with those of major competitors, allowing only a small deviation. Besides, both used some form of personalised pricing alongside discounting. Thus, the findings of this study align with Chen and Chen’s (2017) assumption about the high potential of personalised pricing for online and multi-channel retailers. Bundling was highly successful in one of these companies and non-existent in others, which indicates that this pricing strategy might not have a consistent effect on the sales volumes in online electronics vendors. Discounting was identified as the most broadly adopted pricing strategy, with all three sample companies demonstrating evidence of it. Competitive pricing and personalised pricing were used by the two vendors whose sales volumes increased significantly over the past year, which has enabled the researcher to make a conclusion about the high effectiveness of these strategies. Considering bundling, one interviewee reported its positive impact on the sales volumes, while another reported a negative one. These findings align with the past researchers’ conclusions about the highly conditional effectiveness of bundling (Ma, 2017; Sahay et al., 2015; Shao, 2017). Overall, the heavy reliance on discounting was not sufficient to increase sales volumes as the company with the worst sales dynamics made 80% of its sales on discounted items. The more successful online vendors combined discounting with personalised offers and competitor benchmarking, which could be the optimal mix of pricing strategies for this segment. The conclusions of this study are based on a small sample of three British online retailers. Since this sample size is not statistically significant, the identified patterns cannot be generalised to the whole population of British consumer electronics retailers. The exact sales figures were not reported by the participants because of confidentiality reasons, which prevented the researcher from establishing the quantified impact of pricing strategies on the sales volumes. The findings of this research project indicate that marketers can maximise the online sales of consumer electronics by employing competitive and personalised pricing in combination with discounting. The effect of bundling was inconsistent, so it cannot be recommended to online vendors. It is recommended that future researchers in the field should adopt the quantitative or mixed research design for investigating the relationship between pricing and sales volumes in the online electronics market. For example, interviews with company insiders can be combined with the observations of price dynamics on the retailers’ websites. A longitudinal time-frame can be useful to arrive at more accurate conclusions about the impact of pricing strategies on sales volume. Adams, T. (2017) “Surge pricing comes to the supermarket”, [online] Available at: https://www.theguardian.com/technology/2017/jun/04/surge-pricing-comes-to-the-supermarket-dynamic-personal-data [Accessed on 7 November 2017]. Ajzen, I. (1991) “The theory of planned behaviour”, Organisational Behaviour and Human Decision Processes, 50 (1), pp. 179-211. Best Buy (2017) “Price match guarantee”, [online] Available at: https://www.bestbuy.com/site/customer-service/price-match-guarantee/pcmcat290300050002.c?id=pcmcat290300050002 [Accessed on 7 November 2017]. Boone, L. E. and Kurtz, D. L. (2010) Contemporary marketing, Mason: South-Western Cengage Learning. Cavallo, A. (2017) “Are online and offline prices similar? Evidence from large multi-channel retailers”, American Economic Review, 107 (1), pp. 283-303. Chen, B. and Chen, J. (2017) “When to introduce an online channel, and offer money back guarantees and personalised pricing?”, European Journal of Operational Research, 257 (2), pp. 614-624. Collis, J. and Hussey, R. (2014) Business research: a practical guide for undergraduate and postgraduate students, 4th ed., London: Palgrave MacMillan. Djatmiko, T. and Pradana, R. (2016) “Brand image and product price: its impact for Samsung smartphone purchasing decision”, Procedia – Social and Behavioural Sciences, 219 (1), pp. 221-227. Easterby-Smith, M., Thorpe, R. and Jackson, P. (2012) Management research, 4th ed., Thousand Oaks: Sage. Euromonitor (2017) “Consumer electronics in the United Kingdom”, [online] Available at: http://www.euromonitor.com/consumer-electronics-in-the-united-kingdom/report [Accessed on 9 November 2017]. Fassnacht, M. and Unterhuber, S. (2016) “Consumer response to online/offline price differentiation”, Journal of Retailing and Consumer Services, 28 (1), pp. 137-148. Fjermestad, J. and Robertson, N. C. (Eds) (2015) Electronic customer relationship management, Abingdon: Routledge. Futuresource (2017) “Futuresource UK consumer electronics update 2017”, [online] Available at: https://www.futuresource-consulting.com/reports/report/r/futuresource-uk-consumer-electronics-update-2017/i/498073 [Accessed on 9 November 2017]. Gilbride, T. J., Currim, I. S., Mintz, O. and Siddarth, S. (2016) “A model for inferring market preferences from online retail product information matrices”, Journal of Retailing, 92 (4), pp. 470-485. Jiang, Y., Shang, J., Liu, Y. and May, J. (2015) “Redesigning promotion strategy for e-commerce competitiveness through pricing and recommendation”, International Journal of Production Economics, 167 (1), pp. 257-270. Kilroy, T., MacKenzie, I. and Manacek, A. (2015) “Pricing in retail: setting strategy”, [online] Available at: https://www.mckinsey.com/industries/retail/our-insights/pricing-in-retail-setting-strategy [Accessed on 7 November 2017]. King, N. and Horrocks, C. (2010) Interviews in qualitative research, London: Sage. Kocas, C. and Akkan, C. (2016) “A system for pricing the sales distribution from blockbusters to the long tail”, Decision Support Systems, 89 (1), pp. 56-65. Kocas, C., Pauwels, K. and Bohlmann, J. D. (2018) “Pricing best sellers and traffic generators: the role of asymmetric cross-selling”, Journal of Interactive Marketing, 41 (1), pp. 28-43. Krafft, M. and Mantrala, M. K. (Eds) (2009) Retailing in the 21st century: current and future trends, 2nd ed., Berlin: Springer. Kukar-Kinney, M. and Carlson, J. R. (2015) “A fresh look at consumers’ discounting of discounts in online and bricks-and-mortar shopping contexts”, International Journal of Research in Marketing, 32 (4), pp. 442-444. Kuo, H.-C. and Nakhata, C. (2016) “Price promotions and products with low consumer ratings”, Journal of Consumer Marketing, 33 (7), pp. 517-527. Lee, K. Y., Jin, Y., Rhee, C. and Yang, S.-B. (2016) “Online consumers’ reactions to price decreases: Amazon’s Kindle 2 case”, Internet Research, 26 (4), pp. 1001-1026. Lei, J., Jia, J. and Wu, T. (2015) “Pricing strategies in dual-online channels based on consumers’ shopping choice”, Procedia Computer Science, 60 (1), pp. 1377-1385. Lin, H.-H. (2015) “The effects of price-matching guarantees on consumer response in an online retail context: the moderating role of consumer search costs”, Journal of Service Theory and Practice, 25 (6), pp. 658-679. Ma, S. (2017) “Fast or free shipping options in online and omni-channel retail? The mediating role of uncertainty on satisfaction and purchase intentions”, The International Journal of Logistics Management, 28 (4), pp. 1099-1122. Meyer, J. and Shankar, V. (2016) “Pricing strategies for hybrid bundles: analytical model and insights”, Journal of Retailing, 92 (1), pp. 133-146. Morgan, R. M., Parish, J. T. and Deitz, G. (Eds) (2015) Handbook on research in relationship marketing, Cheltenham: Edward Elgar. Perez, S. (2016) “Amazon no longer offers price match refunds on anything but TVs”, [online] Available at: https://techcrunch.com/2016/05/23/amazon-kills-its-price-protection-policy/ [Accessed on 7 November 2017]. Richie, J., Lewis, J., McNaughton Nicholls, C. and Ormston, R. (2013) Qualitative research practice: a guide for social science students and researchers, London: Sage. Robbert, T. (2015) “Feeling nickelled and dimed – consequences of drip pricing”, Journal of Service Theory and Practice, 25 (5), pp. 621-635. Rothenberg, S. and Siems, F. (Eds) (2008) Pricing perspectives: marketing and management implications of new theories and applications, Basingstoke: Palgrave Macmillan. Rutt, R. (2017) “Ebay takes on Amazon, John Lewis and Tesco with a price match on 20,000 brand new items”, [online] Available at: http://www.thisismoney.co.uk/money/bills/article-4667326/Ebay-takes-Amazon-John-Lewis-new-price-match.html [Accessed on 7 November 2017]. Sahay, A., Mukherjee, S. and Dewani, P. P. (2015) “Price discount framings on product bundles with shipping surcharges in the Indian market: examining the weighted-additive and reference-dependent models”, Journal of Indian Business Research, 7 (1), pp. 4-20. Saldana, J. (2008) The coding manual for qualitative researchers, London: Sage. Saunders, M., Lewis, P. and Thornhill, A. (2009) Research methods for business students, 5th ed., London: Pearson Education. Schreier, M. (2012) Qualitative content analysis in practice, London: Sage. Shao, X.-F. (2017) “Free or calculated shipping: impact of delivery cost on supply chains moving to online retailing”, International Journal of Production Economics, 191 (1), pp. 267-277. Silverman, D. (2015) Interpreting qualitative data, 5th ed., London: Sage. Song, J., Yin, Y. and Huang, Y. (2017) “A coordination mechanism for optimising the contingent-free shipping threshold in online retailing”, Electronic Commerce Research and Applications, 26 (1), pp. 73-80. Sunil (2015) “Trends and practices of consumers buying online and offline: an analysis of factors influencing consumer’s buying”, International Journal of Commerce and Management, 25 (4), pp. 442-455. Tan, P. J. and Bogomolova, S. (2016) “A descriptive analysis of consumer’s price promotion literacy skills”, International Journal of Retail and Distribution Management, 44 (12), pp. 1223-1244. Yao, J. and Oppewal, H. (2016) “Unit pricing increases price sensitivity even when products are of identical size”, Journal of Retailing, 92 (1), pp. 109-121. Zheng, X., Lee, M. and Cheung, C. (2017) “Examining e-loyalty towards online shopping platforms: the role of coupon proneness and value consciousness”, Internet Research, 27 (3), pp. 709-726. How long has your company been selling consumer electronics online? How would you estimate the market share of your company? Have your sales volumes increased, decreased or stayed roughly the same over the past year? We started in London twelve years ago. Now we deliver across England, Scotland and Wales. Rather small. About 1%, maybe. We can’t really compete with Maplin or Currys on price. They will always have it lower. But, on the good side, we can stock the items they don’t bother to have. All that special, geeky stuff that is not wanted by many people, but still wanted by those who have the money to pay. Do you offer the more mainstream items too? Yes, sure. We got most website traffic from these as people look for them more often. But it is the rare, special items that bring us the bulk of profit. What about quantities? Do you sell more of mainstream or special goods? It depends, it highly depends on the product kind or model. We might sell one item in thousands and another in dozens. It’s almost impossible to tell in advance with special items. As of mainstream goods, we are generally able to sell the whole several-hundred lot we get. When pricing these mainstream goods, do you consider the prices of your competitors? We don’t want to put customers off by charging too much. We use Currys as a benchmark and keep the difference within 15%. We usually discount older models. When we display links to other goods on the discount page, those also sell better. They don’t even need to be related. This year we’ve tried just showing random stuff, and it worked. We don’t think it’s a good practice. No one would be happy to know that someone has paid less for the same thing just because they logged from a cheaper smartphone. The only thing we do is personal discounts to regular customers on their birthdays. This is not discriminative, and they appreciate it. We can see it by nearly a half of them making a purchase with these birthday discounts. Our items are rather expensive, and they are not bought frequently. Little point knocking them together in bundles. Shipping is free for orders above the threshold. That’s a way to make customers buy more goods at a time. We’ve had a good growth. Five years ago, we opened online sales from our brick-and-mortar stores. 5% in London and 2-3% in other areas. It’s not actually necessary to have lower prices. All major players set them at roughly the same level. So, we keep this level too. We introduce discounts by product groups. It may be phones one week, tablets the other and laptops the next. How large are your discounts? From 5% to 15%. Very seldom we make discounts of 20% or 30%. These look impressive to customers and produce lots of extra sales. But they also mean a loss at each sale as we’re not able to recover the cost. So, we only do it when there’s no way to sell at a full price. That usually happens when a new model is already out and we still have a few old units on stock. Does discounting increase the sales of other, non-discounted items? Cross-sales, yes. They’re particularly strong when we discount a popular item. Even by 5%. So, we’re doing this more often now. We have a loyalty programme with personal discounts. Loyalty points are given for each purchase. The more points a customer collects, the greater personal discount they have. Personal discounts apply only to the items selling at regular price, not to those already discounted. Do you have different prices for the same item online and offline? No. We have the same price online as in the physical store. Yes, we have bundles of complementary products – a Blue-ray player and speakers and headphones, for instance. The price of a bundle is 5% to 10% lower than for purchasing the same products by one. Do bundles sell better than individual products? Overall, they do. The sales of some products increased by 20-25% after they became part of a bundle. Do you offer free or paid shipping and why? We charge for delivery to keep our costs in check. We are selling more than a year ago. We measure it by product segments. In some it is as high as 7-8%, in others less than 1%. We monitor competitors’ prices closely, but we can’t always match them. As a small company, we have higher costs per unit. That’s not a problem. Rather, the problem is that more customers are unwilling to pay full price for devices. They’re always on a search for bargains. We make about 80% of our sales on discounted items. We aim at always having about 10% of our product array selling with a discount. Also, we have sales at the end of each month when discounts can be as large as 50%. We see a strong rise in site visitors and sales in this period. Which products do you select to be discounted? Generally, we discount those that do not sell as well as expected. Do you see discounts increase the sales of other, non-discounted items too? Er… not really. I’d not say that usually happens. In most cases, it is only the discounted item that sells much better. No. Developing customised offers is rather expensive. Only large vendors like Amazon can afford it. We bundle the items that would likely be used together, like laptop and mouse. However, bundles do not always sell better than individual products. Recently we’ve actually had to unbundle some packages to improve sales. How do you price bundles? We discount them against the full price of the same goods by three, five or seven percent. We always feature this discount for customers to see right away how much they save. Why do you think your bundles did not always sell up to expectations? I believe that’s the changing customer habits. We did not have this problem until about a year ago. Maybe they prefer to keep using their old mouse with the new laptop, or they want some very special case for their smartphone and get it elsewhere. Maybe they just don’t like someone else making a choice for them. The Millennial generation of customers are very independent. We ship freely in London area and charge for shipping to other regions. We have a warehouse in London, so it is much cheaper and faster to deliver within the capital city. I’d say they are roughly the same. Maybe a very minor growth. The economy is still slow, and people do not want to spend much on electronics.